Helical piles are factory-manufactured steel deep foundation elements used to penetrate weaker or otherwise unsuitable near-surface material for end-bearing within deep competent soils. The most common solid square and hollow round shaft sizes have outer dimensions generally less than five inches. These piles can be advanced with smaller installation equipment, yet can achieve torque-correlated allowable capacities up to about 65 kips. 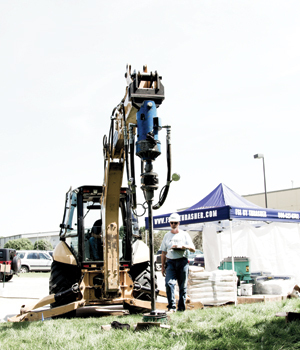 However, when slender helical piles are advanced through loose, soft, or fluid soils, buckling analyses are considered, which may result in either down-rating the pile capacity and requiring more piles, or upsizing to a larger shaft diameter that can support the design working loads. The Helicast™ Grouted Helical Pile System generates capacity as a combination of end-bearing and skin friction and may be considered to address a buckling concern or for its other potential benefits. Helicast™ piles consist of standard solid square shaft lead and extension sections with a lead displacement plate generally at the first coupler location, and extension displacement plates at each coupler location thereafter. The pile is advanced through a grout reservoir at the surface. The lead displacement plate pushes soil outward and away from the central shaft and allows specialty micropile grout from the reservoir to flow by gravity into the void being created. Extension displacement plates help to maintain the size and shape of the grout column as the pile is advanced. 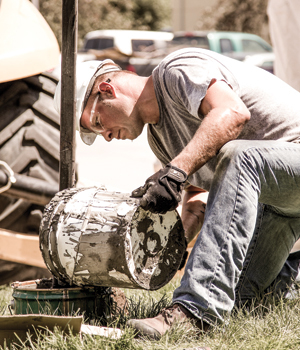 Helicast™ piles can be advanced with smaller equipment in limited access areas. Installation is vibration free and does not generate spoils. The grout column surrounds the pile shaft to create a pile that is more resistant to buckling. 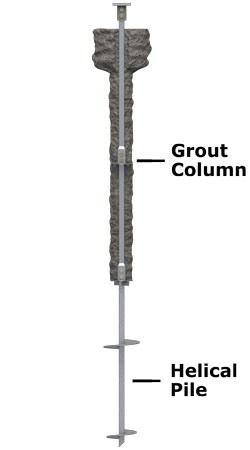 The grout column offers additional corrosion protection in aggressive soil profiles. A grouted helical pile may develop capacity in marginal soil conditions where a standard end-bearing helical pile may not. There is additional “frictional” capacity at the grout/soil interface. Frictional piles typically deflect less than end-bearing piles for a given load. Where favorable soil conditions exist, a Helicast™ pile may achieve allowable capacities exceeding 100 kips, which may then be considered as an economical alternative to large diameter helical shaft sizes or other deep foundation options. 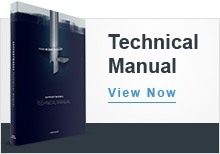 For more information about helical piles and the Helicast™ Grouted Helical Pile System, view our Technical Manual and Supplemental Materials in the Technical Information section.